The Australian government has angered the leading international cigarette brands. 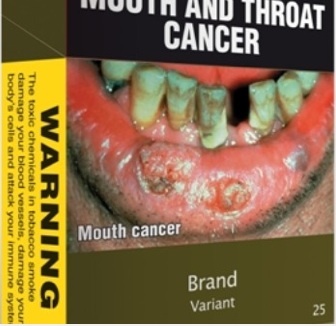 It has ordered companies to remove the branding from their cigarette packets. This means from January the 1st, 2012, there could be no logos on cigarette packs. All cigarette boxes will be a dull, olive green colour that was specially chosen because people thought it was so unattractive. In addition, all product names will be the same size, colour and font. Politicians believe that taking away any brand appeal will reduce smoking. The Australian government ___________________ leading international cigarette brands. It has ordered companies to ___________________ from their cigarette packets. This means from January the 1st, 2012, there ___________________ on cigarette packs. All cigarette boxes will be a dull, olive green colour that ___________________ because people thought it was so unattractive. In addition, all ___________________ be the same size, colour and font. Politicians believe that taking away ___________________ reduce smoking. The Australian government has (1) ____ the leading international cigarette brands. It has ordered companies to (2) ____ the branding from their cigarette packets. This means from January the 1st, 2012, there could be no logos on cigarette packs. (3) ____ cigarette boxes will be a (4) ____, olive green colour that was specially chosen because people thought it was (5) ____ unattractive. In addition, all product names will be the same size, colour and font. Politicians believe that taking (6) ____ brand appeal will reduce smoking. believe that taking away brand appeal will reduce smoking. It remove has the ordered branding companies to. no logos There on could cigarette be packs. so people unattractive thought it Chosen was because. All the product same names size will be. reduce will appeal brand away Taking smoking. brand cigarette leading world’s the of Maker. unfair is there means packaging New competition. says are law logos property The. their have boxes to put Pictures on they. made We’ve decision right the. Write about cigarettes for 10 minutes. Show your partner your paper. Correct each other’s work. 2. CIGARETTES: Search the Internet and find more information about cigarette packaging. Talk about what you discover with your partner(s) in the next lesson. 3. MAGAZINE ARTICLE: Write a magazine article about cigarettes. Include imaginary interviews with the boss of Philip Morris and Australia’s prime minister. Read what you wrote to your classmates in the next lesson. Give each other feedback on your articles. 5. LETTER: Write a letter to the boss of Philip Morris. Ask him/her three questions about cigarettes. Give him/her three of your opinions on them. Read what you wrote to your classmates in the next lesson. Your partner will answer the questions you asked.